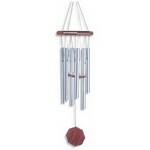 The 7-inch “Invigoration” energy chime features a hardwood ash base. Three tones: A, E, and A with mallet included. J.W. Stannard has long been recognized as one of the premier chime manufacturers. According to the most recent research, 85-percent of responding consumers bought J.W. Stannard chimes because of the sound quality. Each rod is tuned and the sound is so precise, it is considered a musical instrument. 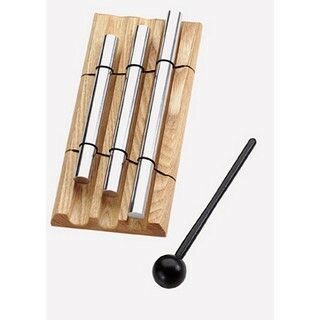 Each rod will maintain the chime's perfect pitch and never rust. Diamond Line, the indestructible fiber used to tether satellites, holds the Stannard rods to the wood base. A mallet is included. 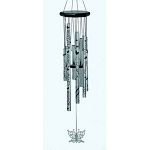 A JW Stannard Wind Chime requires very little maintenance. 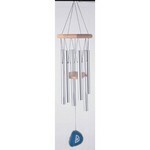 Depending on how much rain and sun the wind chime is exposed to, the wood may periodically need some wood protection product to help preserve its original beauty. As well, each rod is made of a specially developed metal alloy that is guaranteed to never rust.